Tightening and flattening your stomach requires the combination of both a low body fat percentage and abdominal muscular tone. As a result, your exercise program should include calorie-burning cardio exercises and abdominal strengthening sessions. How much exercise you need to do to get a flat stomach depends on how much excess fat you're carrying. 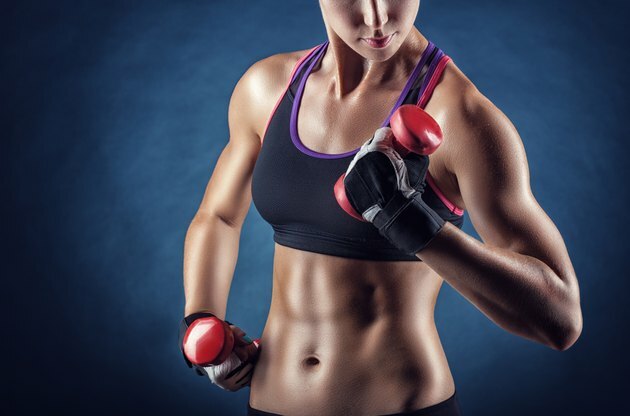 While not everyone will be able to attain flat abs, with an appropriate training program and a healthy eating plan most people can develop flatter, stronger and more toned abs. To flatten your stomach, lower your body fat percentage by burning a higher number of calories than you consume. Every time you burn 3,500 more calories than you consume, you'll lose a pound of body fat. Therefore, to lose stomach fat you'll want to increase the number of calories you burn with frequent cardio exercise and limit the calories you take in by following a healthy eating plan. A healthy rate of fat loss is 1 to 2 pounds per week, which requires a weekly calorie deficit of 3,500 to 7,000 calories. The type and intensity of exercise, along with your body weight, will dictate how many calories you burn during your workouts. According to Harvard Health Publications, running is among the most efficient type of cardio workout for burning calories. A person weighing 155 pounds would burn about 298 calories in 30 minutes of running at 5 mph and about 465 calories in a 30-minute run at 7.5 mph. To create a deficit of 3,500 calories and thus lose a pound of fat, the same person would need to complete about 12 30-minute runs at 5 mph or about eight 30-minute runs at a pace of 7.5 mph. A person weighing 185 pounds will burn about 355 calories in a 30-minute run at 5 mph and about 555 calories in a 30-minute run at 7.5 mph. He could create a deficit of 3,500 calories and lose a pound after about 10 30-minute runs at 5 mph or after about seven 30-minute runs at 7.5 mph. Other top calorie-burning cardio exercises are swimming, bicycling, rock climbing and jumping rope. Regular strength training that targets the abdominals will help you develop muscular tone at your stomach. A 2009 study published by the American Council on Exercise found that crunches on an exercise ball, bicycle crunches and vertical leg crunches are among the most efficient exercises for targeting the major abdominal muscles. Abdominal and full-body strength-training workouts scheduled two to three days per week -- with a day of rest in between each workout -- will help you lower your body fat percentage. During your workouts, complete two to three sets of 12 to 15 reps of each exercise. Limiting your calorie intake is just as important as exercise for creating the caloric deficit necessary for losing fat and flattening your stomach. The American Council on Exercise makes a few recommendations for managing your calorie intake. East breakfast daily and have several small meals throughout the day, but decrease each meal portion by 10 to 15 percent. Focus on fruits, vegetables, whole grains, and non-fat and low-fat dairy products. This will ensure your body is getting the nutrients it needs while preventing you from taking in too many calories.